Sahara Trading Company is located on Main Road, Gharibabad, Tehkal Bala, Peshawar. We are importer and exporter company that also provides custom clearance and freight forwarding services. 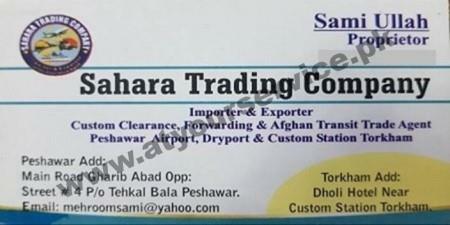 We are Afghan Transit Trade Agents at Peshawar Airport, Dry Port and Customs Station Torkham. Our branch office is located in Dholi Hotel near Customs Station Torkham.